Every day, I make some time to flick through the recent discussion on the popular social network, twitter. There’s always a lot going on and, even though I do a few things to make the process of sorting through the news feed easier, it can become a bit repetitive. When someone does something different, it’s like they’ve jumped out of the platform, slapped you in the face and forced you to pay attention. 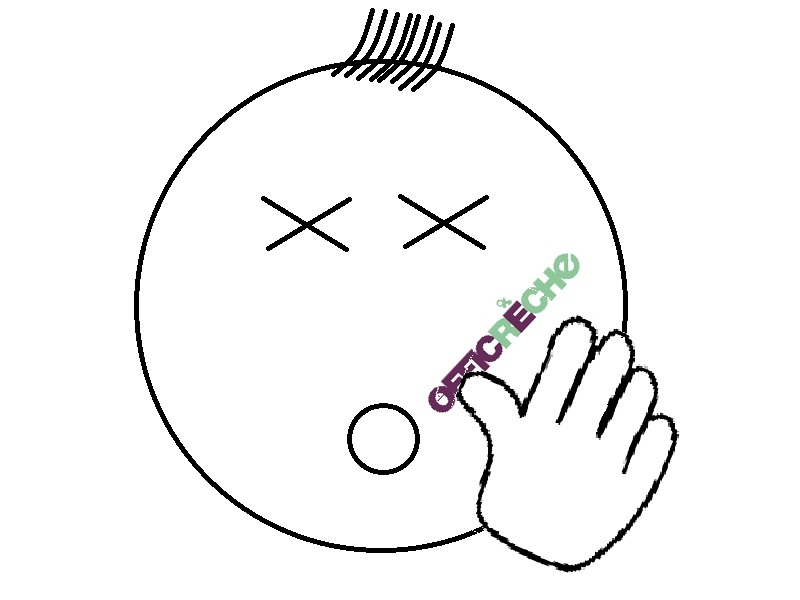 And that’s what happened to me just now: Officrèche found its voice and proceeded to slap me right in the face. Officrèche is a nursery and co-working space based in Brighton. It allows working parents to book a childcare session while they work in the office space upstairs. It’s a great idea and one that you can find out more about in an earlier article on how smaller nurseries can compete with larger chains. What did Officrèche do to catch your attention? 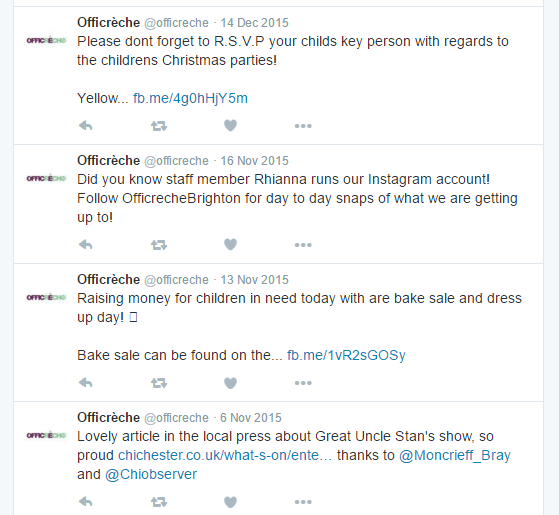 In short, Officrèche began to use its twitter profile differently: crafting it’s tweets and related content to target its audience and communicate the unique offer of its service. The picture shows a relatively straight forward stream of general updates about what’s happening at the nursery (with some links shared from facebook). Although there’s nothing necessarily wrong with the approach, it’s standard fare that you might expect from any nursery. Officrèche is itself a bit different, so I’d like to see something to reflect the same…and they have recently done just that. Thwack! The image stands out like the red mark on my cheek. It draws your attention to the content of the tweet: a recommendation for parents who might be interested in taking their children to a local and current event. I’ll highlight who that content is relevant for: local parents – people who may want to use a nursery. Great stuff. Again we have the image, but this time we have a link to an article about returning to work after having a baby. This is clearly targeted at working parents (or parents who may be considering returning to work). In other words: people who may want to use a nursery and/or a co-working space. I like it! This third example is the one that really left the words “Officrèche” imprinted across my face. The topic of the tweet has nothing at all to do with parents. The tweet references a popular local business event that people who might use a co-working space are likely to be interested in…some of whom may be parents. This all demonstrates that, as well as local parents, Officrèche is making an effort to target local freelancers / business owners who may or may not be parents. By tailoring the content of the tweets – and the related content – this new approach puts Officrèche in front of potential customers and it reinforces its unique position as both a nursery and a co-working space. The intelligent construction of the tweets is what caught my attention, but the carefully targeted content cemented by interest. All of the tweets highlighted above link to content that Officrèche has created themselves on their own website. If you take a few minutes to visit Officrèche’s blog, you’ll find a good mix of articles that cover both the working and parent elements, with some crossover. By placing more emphasis on the promotion of their own content, I suspect Officrèche is hoping to drive more traffic to the website with a view to generating more leads. We’d have to access the analytics to find out if the new approach is working, but I think they’re on to something. Creating high-quality content on a regular basis is a lot of hard work. Having said that, new blog posts are regularly being added to the website and the tone of voice is coming together nicely and authentically. Officrèche also continue to strike a balance between broadcasting information and engaging directly with people on twitter. I’m certain that they’ve now found their voice. What’s particularly reassuring is that the team appear to have adopted a test and learn approach to get to this point. If Officrèche continue to experiment and fine-tune, as they have done so far, I’ve no doubt that their new approach will lead to even more success. So, Officrèche, you have my attention but I’m going to protect my face – who knows what great ideas you’ll come up with next? I reached out to Officrèche to let them know that I was writing this article and received the following response from Rob Trounce who manages their social media strategy (edited for brevity). that Venn diagram sweet-spot of parents who own small businesses. It’s good to see that Officrèche are already getting the results they deserve from a well thought out campaign. It’s also good to see the benefits a carefully selected marketing professional can provide! Definitely a case of “great work everyone involved”! Who is your target audience and what is your unique selling point? How can you best communicate the benefits of your service? What’s the most appropriate way for you to use twitter? What balance should you strike between engaging directly with people or broadcasting information? How should your use of twitter align with all the other tools and channels at your disposal (including offline)? Do you have enough time and expertise to create your own high-quality targeted content? What are your overall goals? What do you need to measure to find out if your approach works? Hi Elizabeth. Thanks for commenting and excellent work! I’m glad you mentioned the importance of your team. People are the most important part of a nursery and if what you’re saying isn’t authentic – and/or doesn’t match the reality – then your audience will soon discover it. Rob’s response did cover your brand being an amalgamation of everything you guys do and the importance of reflecting it appropriately, but I’m afraid I chopped that bit out. You’re also right that it’s a long game. But seeing as you’ve already got some decent results…I’m expecting to hear some great things in future! I’m a qualified journalist and write blogs for a journalism training organisation, too. When the opportunity came up to manage the parents’ side of the blog and social media, I thought what would I want to read? What’s interesting to me? You should always write for the audience you want by being interesting to them. I intend to keep it up. Writing for your audience is what it’s all about. It’s also important to keep on going – even though it’s not easy. There’s a definite correlation between prolificacy (quality as well as quantity) and traffic on our site. So…do keep up the good work!